We are pleased to announce that Systal Technology Solutions has been awarded the ISO 27001 Information Security Management certification, validating our investment in, and best practice approach to information security management. 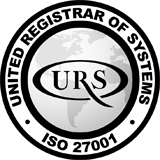 To become ISO 27001 certified, as a company we underwent a rigorous evaluation process that included quality management system development, a management system documentation review, audit and initial assessment, which were all successful. Obtaining this certification confirms Systal’s commitment to security and the confidentiality of our customers’ information and technology. In today’s world the threat of cyber-attack is high, and Systal, through ISO 27001, demonstrates that our practices achieve a high standard of protection for our own business and that of our customers. This announcement comes following a momentous year for Systal, which has seen the recruitment of over 60 new employees, the successful conclusion of numerous IT infrastructure transformations with a national energy provider, and has also seen us win new high value projects with several enterprise organisations including a global whiskey distillery and a national energy fuels distributor. On top of all this we have announced a partnership with enterprise cloud computer provider Nutanix, allowing us to widen our technology offering.